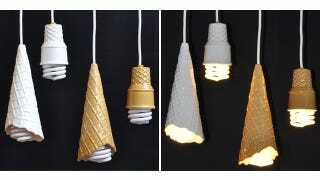 Soft Serve Cone Lamps: What? No Sprinkles? Inspired by Mr. Whippy, a UK-based ice cream seller, Alex Garnett created these hanging pendant lamps that look like soft-serve ice cream cones when you install a twisted compact fluorescent bulb. The effect works particularly well with the smaller cones, but the waffle variety? I'm not convinced. I want to see a big scoop of ice cream sticking out of there, and while I'm all for ridding the world of inefficient incandescents, this might be the only application where they're still useful.